Maybe that story is true, maybe it isn’t. But it fits. Even when we’re denying that regulations are responsible for our poor economy, we’re talking about regulations. And the more people hear about regulations, no matter what the context, the more plausible it seems like they might be a problem. And of course, it also distracts us from talking about other stuff. It’s a twofer. The data show that investment has increased more in this recovery than in the prior two recoveries and roughly the same as that of the 1980s recovery. 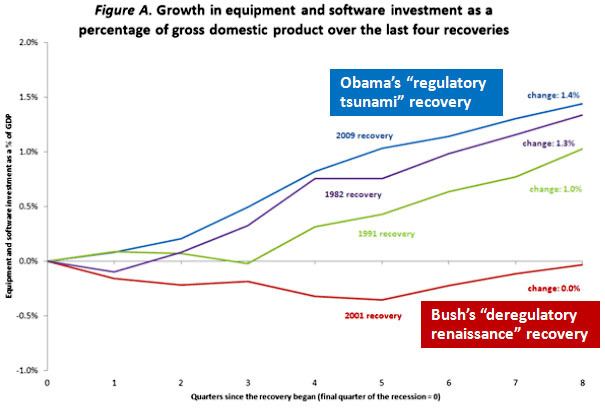 It is interesting to note that there was no growth in investments (as a share of GDP) in the George W. Bush recovery. That means that this recovery, with Obama regulations pending, is far more investment-led than the recovery under the deregulatory Bush administration. So, investment does not look like it is being held back, at least relative to other recoveries and the size of the market. The chart is below. Bottom line: If demand were high but regulation was holding back recovery, then investment levels would be weak, employer surveys would be full of complaints, and businesses would be making lots of temporary hires in order to sell more stuff now without the danger of adding permanent payroll. But none of these things is true. Our problem is high debt levels and weak demand, not business-deadening regulations.